Eat Better. Move More. Make a Change. Three key messages featured across Alabama billboards in 2017. 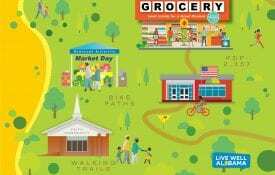 Alabama Extension’s Supplemental Nutrition Assistance Program–Education (SNAP-Ed) created a series of billboards to create appeal for healthy behaviors that can prevent obesity in underserved Alabama communities. The billboard campaign reached all corners of the state and also attracted more than 55 million views in 12 weeks. The campaign included 94 billboards in 51 counties; 80 percent of these counties are classified as rural. The campaign is part of a comprehensive effort to change local and statewide policies, systems and environments to make healthy eating and active living more desirable and attainable. “Eat better: Have you had a fruit or vegetable today?” encourages Alabamians to adopt healthy eating habits, specifically fruit and vegetable consumption. “Move More: Grab a best friend and go for a walk!” encourages Alabamians to find simple, enjoyable ways to be physically active. “Make a Change: Make water your go-to drink” encourages Alabamians to regularly replace sugar-sweetened beverages with water. For the past three years, Alabama SNAP-Ed has also conducted a statewide social marketing billboard campaign and evaluation. Results from phone surveys show significant increases in intention to make healthy behavior change among Alabamians who recalled the billboard messages. The billboard campaign is an extension of SNAP-Ed’s obesity prevention efforts across Alabama. The flagship program is Body Quest: Food of the Warrior, a school-based obesity prevention initiative for third graders and their parents in low-income schools and communities across the state. Body Quest has consistently shown significant increases in fruit and vegetable consumption and other healthy behaviors through impact evaluation. When possible, the billboards are placed close to Body Quest schools to raise awareness and create appeal for healthy eating in communities.